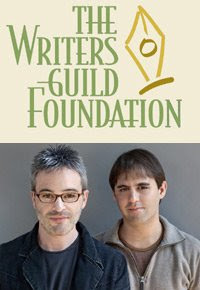 Alex Kurtzman and Roberto Orci will join the Writers Guild Foundation in Los Angeles for a special evening honoring their work on Tuesday, May 26 at 7:30 pm. Kurtzman & Orci will talk about their careers and the projects that made them famous, and will take Q & A from the audience. Tickets are available for $20, with discounts available for students and WGA members. Visit the Writers Guild Foundation for complete details.